Should Katharine have accepted the annulment of her marriage? Henry VIII went to great lengths to annul his marriage to Katharine of Aragon. 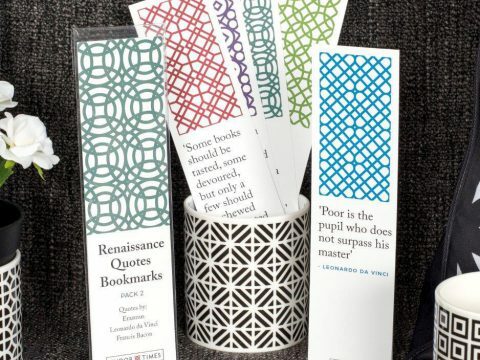 It took some seven years, and inordinate efforts from the King and his courtiers, the most famous of whom, Cardinal Wolsey, lost his role as Henry’s right-hand man and trusted advisor as a result of his inability to settle the ‘Great Matter’ to the King’s satisfaction. 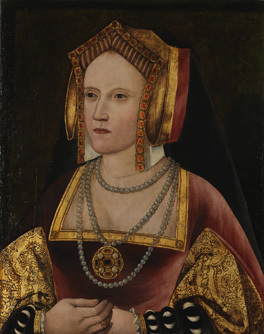 Katharine fought the annulment strenuously, and even when ill, banished from court, and in virtual imprisonment, she refused to accept the verdict of the court convened by the Archbishop of Canterbury, Thoms Cranmer. Cranmer pronounced sentence after the English Parliament had rejected the authority of the Pope in England and proclaimed Henry as Supreme Head of the Church in England. We ran a survey in late January 2017 to see whether or not our Facebook readers thought Katharine should have accepted the annulment of her marriage. 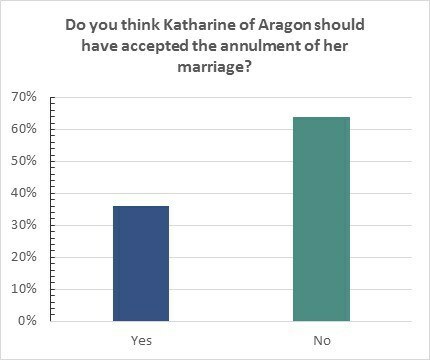 The results summarised in the graph below, show that a clear majority (64%) think Katharine was right to refuse to accept the annulment.